Wishing all my friends, family and readers a happy and HEALTHY year ahead, starting with this gorgeous sweet potato tzimmes, which will definitely make an appearance on our holiday table this coming week! Read through before you start — the magic is in how you prepare the baking dish. It should be good and hot, the oil fragrant and almost spitting, before you fill it with the ingredients. Bake the sweet potatoes one day prior, and set aside. Preheat oven to 350F. Heat 2 Tbsp. oil in skillet on medium heat. Saute onions until translucent, add carrots, and then continue to cook until both are golden. Peel the oranges and cut in half along the “equator” line of the orange. Squeeze out the juice, and add the sweet potatoes, fruits, spices and salt, all into a large mixing bowl. Pour in the onion and carrot mixture, and mix together lightly so the ingredients remain somewhat distinct. Place large, shallow baking dish, containing remaining 1 Tbsp. olive oil, into oven. Allow dish and oil to heat approx 5 min until quite hot. Tilt the dish so the oil coats it well. 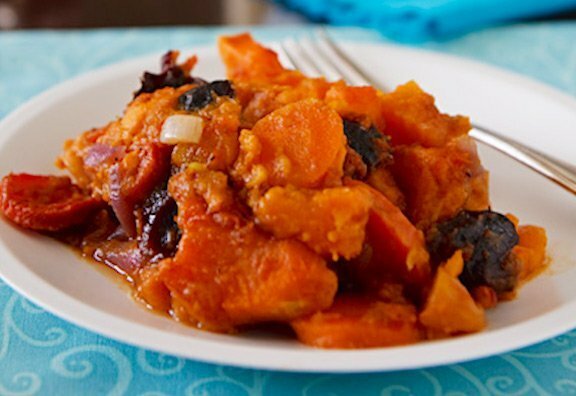 Carefully remove hot dish from the oven, add sweet potato mixture, and sprinkle with walnuts. Return to oven and bake 45-50 minutes, until top is crusty. Serves 6-8. Fantastic leftovers. Thank you to Nava Atlas at vegkitchen.com for this lovely recipe, adapted from Vegan Holiday Kitchen.